ANet helps schools and districts transition effectively to the Common Core through collaborative routines for planning from standards, assessing student progress, and adapting instruction based on student needs. How can school and district leaders best support teachers through the transition to the Common Core? For educators, many of the traditional sources of stability and direction—curricula, lesson plans, their own mastery of material—are being shaken by the Common Core. To support schools and districts, ANet offers a guide with case studies: “Focusing on the How: Guidance for School and District Leaders on Supporting Teachers Through the Transition to the Common Core.” The paper was released with a suite of Common Core resources published by the Aspen Institute Education & Society Program. 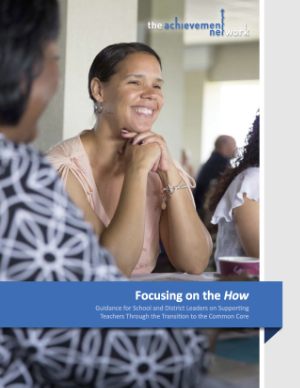 In the schools and districts where ANet has seen the most effective transitions to the Common Core, leaders are actively focused on helping teachers regain that sense of stability through consistent, collaborative routines for planning from standards, assessing student progress, and adapting instruction based on student needs. "Focusing on the How" shows how these proven routines provide scaffolding for implementing the Common Core.